I’ve spent the last 13 years consumed by Black Friday (as a shopping expert, it’s part of the job), and I see it for what it is: Over-hyped, overdone, over-advertised, and like me, you should be over it. Don’t waste your precious post-holiday morning freezing in the cold outside a Walmart¹. Instead, spend it thinking up new turkey-leftover recipes. Start writing your Christmas cards. Watch the Bond marathon on TV. Better yet, go for a run or a long walk. But whatever you do, don’t set foot in a store that’s been open since 10:00 p.m. Thanksgiving night. Here’s why. Those deals? They’ll have ’em next weekend too. Black Friday used to be one day, but as with “Christmas creep,” Black Friday has expanded to fill our need for frantic shopping. Those cheap TVs and vacuums in the Black Friday circular? Other models will take their place next weekend, and the next. Stores stack the deck. This year more than ever, stores aren’t selling the big “doorbuster” stuff at all before Black Friday. Why’s that? They don’t want you to be able to do some research. That’s the case with the laptop on the cover of Walmart’s circular, the HP 2000-bf69WM. It’s advertised for $279, but that model is for sale nowhere else, so you have no chance to check it out ahead of time. Then there’s the fine print. The biggest deals, the doorbusters, are scarce — sometimes only 5 or 6 per store. And “$100 off” probably isn’t $100 off the usual selling price, it’s off the MSRP, and no one ever pays that price anymore. 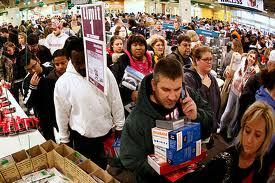 Black Friday stinks for hourly workers. Let’s face it: These poor people don’t get a holiday at all. Walmart is supposed to open at 10:00 p.m. on Thanksgiving and just stay open through Friday. Target opens at 9:00 p.m. and Sears opens at 8:00 p.m. Where does it end? Skip Black Friday. Do this instead! And use today to pull out all the stuff you might have bought at the end of last year — cards, ribbon, wrapping paper. Could be you don’t need any more. Shop at stores that don’t “do” Black Friday at all. I’m a fan of T.J. Maxx and Marshalls² (both stores are owned by the same company). This is one of the few national retail chains that doesn’t go completely berserk over Black Friday. In fact, they open at their normal times on Friday, after their employes have enjoyed Thursday with their families and friends. These stores don’t do fake bargains in circulars – they have brand-name, current merchandise always at 20% to 60% off. Hit up your local small businesses. When you shop local, 68% of your dollar stays in your local economy. Shop at a big-box chain and only 43% of your money stays local³. And small businesses are more likely to have unique items. Check their return policies, though. Small shops may not offer the same lengthy post-holiday return policy that big stores do. Don’t forget about Small Business Saturday; if you have an AMEX card, you can get a $25 statement credit if you spend at least $25 at a small business. So sleep in and enjoy your Friday! 1. There’s word that Walmart workers are planning a Black Friday walkout. 2. You should know that through the holidays, I am a compensated spokesperson for T.J. Maxx and Marshalls. But I have to say, the more I shop in these stores, the more I like them. The employees seem to actually care. I always find some neat item. And I just love that they don’t buy into the Black Friday craziness. 3. This is according to the widely quoted Andersonville study. You’ll see other figures out there, but this study, in my opinion, is the most thorough and logical. This entry was posted in Shopping and tagged Black Friday, Marshalls, T.J. Maxx, Walmart. Bookmark the permalink.